Posted on Thu, Nov 17, 2011 : 5:58 a.m. The building at 312 S. Main St. in downtown Ann Arbor sold to a Metro Detroit ophthalmologist for $3.85 million. A downtown Ann Arbor building with four popular destinations - Melange Bistro, The Ark, Rush Street and Conor O’Neill’s - sold last month in a $3.85 million deal. A Metro Detroit ophthalmologist, Dr. Reza Rahmani of Rahmani Eye Institute PC, purchased the building at 312 S. Main St. Jim Chaconas along with Brendan Cavender of Colliers International represented Rahmani in the deal. Amvest Properties had owned the 19th century building since 2003. In 2006, Amvest renovated the lower level, including lowering the basement floor by three feet, according to its website. The building was assessed at $1.78 million for the 2010 tax year, according to Ann Arbor assessment records. Under Michigan law, a property’s assessed value should be nearly equal to half of its market value. Chaconas said the $3.85 million purchase price is in line with what he expected for that strip of Main Street. Chaconas said the same of Rahmani’s purchase in December 2010 of the ex-Ritz Camera building on South State Street near the University of Michigan campus. “Main Street and State Street are the right spots,” he said. The former Ritz Camera building, which became vacant after the store’s national bankruptcy, is now occupied by a 7-Eleven store. Rahmani bought the building at 318 S. State St. at auction after bidding $1.3 million. Rahmani owns some out-of-state real estate and has been looking for property in Ann Arbor to diversify his investments. Fri, Nov 18, 2011 : 5:08 a.m. Okay, if that building is such a good investment: then why did Amvest sell it?! Fri, Nov 18, 2011 : 1:58 a.m.
@ pbehjatnia, re: "The fire safety issue of... a quick exit from fire into the tiny... alley is a disaster waiting to happen." I've never hear of crowded streets/alleys creating an egress problem. Have you? The common wisdom is that once you are out the door, you are home free. And here's an interesting tidbit I heard about The Ark's fire safety: The Ann Arbor Building Dept. supposedly used the rationale that 100% of the occupant crowd would be inside the 400-plus-capacity auditorium while the artists were playing, and then 100% of the occupant crowd would be in the 400-plus-capacity bar/ hallway areas during intermissions. So, instead of using the Max. Capacity number calculations for the whole space -- 800-plus, I've heard -- the City assigned The Ark an Occupancy Number of HALF that, a little over 400! So somehow, I can't get too worked up about The Ark's fire safety. But I'll listen to whatever anyone has to say. Crowded sidewalks, however, do pose a real problem: pity the poor restaurateurs who have to deal with all of those people peering in their windows to check out their menus, wondering what to do with their next hour or so! Terrible! Simply terrible! Thu, Nov 17, 2011 : 10:47 p.m. It's interesting that the building's 2010 assessed value was apparently a bit low (less than half the sale price a year later). The sale means the city gets a bit more in property taxes. Thu, Nov 17, 2011 : 9:16 p.m.
And there is much rejoicing for the turnover in management of Melange!!! Thank you Mr. Rahmani. Although it would be nice if you upgrade the heating for the Ark so that it's not either freezing or roasting. Thu, Nov 17, 2011 : 7:32 p.m.
Why do you wonder that? And how do you see that affecting this particular news? Thu, Nov 17, 2011 : 6:15 p.m. If &quot;the rents go up 20% every 5 years&quot; when retail sales overall are basically flat or just covering inflation, I'd say these properties are a recipe for disaster. No wonder all the non-expensive restaurant type businesses are closing downtown. Thu, Nov 17, 2011 : 1:43 p.m.
A2.com, Whatever happened to the study on low assessments of business real estate? How much money is the city losing in tax revenue? Thu, Nov 17, 2011 : 1:33 p.m. Surprised the price wasn't higher. Thu, Nov 17, 2011 : 12:58 p.m.
&quot;19th century building... &quot; Well, sort of. The South wall -- shared with Conor O'Neill's -- and the North wall -- shared with Ed Shaffran's Pratt Block building -- date from then. The rest of the building was destroyed by a fire, and all of the construction between those two walls dates from the 40s or later. It was a Sears, Roebuck store (Melange was where they sold the guns) up until Sears moved to Briarwood in the early 70s. So! New owner, eh? I hope he's good to The Ark. Specifically, I hope that their rent does not go through the roof when their current lease expires, forcing them to move. The Ark is a great place, and Ann Arbor is served well by having it right there on Main Street. Thu, Nov 17, 2011 : 5:37 p.m. I have gone to Starbucks before standing in line for a show at the Ark, And MANY other stores along Main Street. There are stanchions out, the line is over on the far side of the sidewalk. Doesn't seem like a problem. I'm sure the restaurants LOVE all the people that dine there before seeing a show at the Ark. Thu, Nov 17, 2011 : 1:45 p.m. I hope the Ark is forced to move. 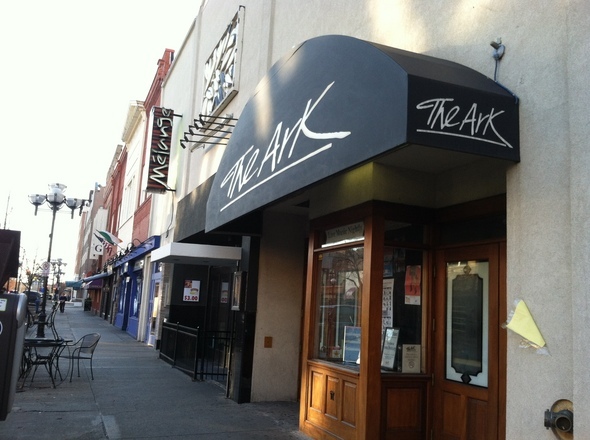 The vArk outgrew it's current venue long ago. The lines of attendees snake around the entire block. Businesses are blocked and lose customers almost every Ark concert. The fire safety issue of the line and a quick exit from fire into the tiny (and usually parked with cars) alley is a disaster waiting to happen. The Ark needs to move to a safer venue. Thu, Nov 17, 2011 : 12:51 p.m.
&quot;Rahmani owns some out-of-state real estate and has been looking for property in Ann Arbor to diversify his investments. &quot; I'm no financial whiz but it seems to me when one diversifies one investments they spread them out over a variety of risks. Buying real estate in area A then buying more real estates in area B doesn't sound like diversifying it sounds like investing in real estate. Thu, Nov 17, 2011 : 3:27 p.m.
Thu, Nov 17, 2011 : 3:11 p.m.
Well, a lot of experts suggest that diversification is a strategy that best serves those who don't become experts in their investment area. If Rahmani or his advisors are well education specialists in real estate investment, they can develop acceptable risk v rate of return strategies while staying within their areas of expertise.